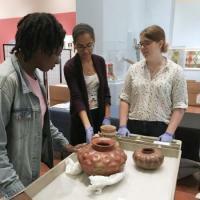 The Summer Curatorial Research Project is an eight-week intensive program for undergarduate students from groups traditionally underrepresented in humanities and/or social sciences who have an interest in museum studies including art education, conservation, collections management. The program is hosted by the University of Virginia museums: the Kluge-Ruhe Aboriginal Art Collection and The Fralin Museum of Art. 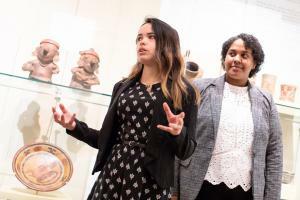 Organized in partnership with the University Office of Diversity Programs and Leadership Alliance with support from the Mellon Foundation, the Summer Curatorial Research Project aims to enhance opportunities for underrepresented students who are considering pursuing graduate studies and/or museum careers. Dates for the 2019 Summer Curatorial program are June 2-July 30, 2019. Field trips to area museums, including an overnignt trip to Washington, D.C.
rising sophomores, juniors, and seniors. Spring 2019 graduates are ineligible. students who identify as African Americans, Hispanic Americans, American Indians, Alaska Natives, Native Hawaiians, and other Pacific Islanders. This program is part of the nationwide Leadership Alliance partnership, and applicants must use their online application to apply. Follow the application guidelines found here to apply for the Summer 2019 curatorial program.